The proper distance from the back wall to the toilet flange. The correct amount of space on both the right and left side of the toilet. The right amount of space in front of the toilet bowl. The best spot would be to put the cold-water supply line in. As you’re calculating this information, it’s best to write this data down for reference. You’ll also want to double-check yourself to ensure all the measurements are correct. Miscalculations can result in unnecessary problems like leaking or uncomfortable seating. Take your time and get it right. You won’t be sorry. What should the toilet flange distance be from the wall? To begin, you’ll want to equip yourself with a tape measure, so you can be sure you’re as accurate as can be. 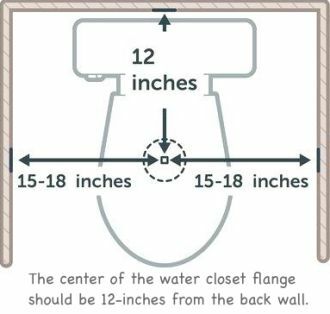 The center of the water closet flange should be 12-inches from the back wall. When you measure this distance, make sure you measure from the finished wall and not the base molding. Another thing you need to consider is the thickness of your back wall. If you used ½” drywall, add an extra ½”. The total distance would now be 12 ½”. If your drywall is thicker than that, add more. Other materials like mosaic tile and mortar have different thicknesses than drywall. Mosaic tile for example has a thickness of 3/8” and mortar has a 1/8” thickness. It’s important that you get these calculation correct, so your toilet rough-in measurements are extremely accurate. The measurements listed above are for your basic toilet featuring a 12” rough-in. If you’re unsure if your toilet has a 12” rough-in, you can look in the owner’s manual. Although 12” is the standard size, some toilets also feature a 10” and a 14” rough-in. It’s important to know specifically what your toilet’s rough-in size is before you calculate the distance from the flange to the back wall. What should the distance be from the toilet flange to any sidewall or nearby fixture? 15” is the minimum distance from the toilet flange to any sidewall or nearby fixture. You can add more space if you want, but 15” is the very minimum. This means the toilet flange should be 15” from the vanity, the shower, the tub, and both the back and side walls. Just like before, if your wall has ½” drywall, you’ll need to add a ½” to the overall length. If your drywall is thicker, then just add a little more. What is the distance from the front of your toilet to any wall or fixture? The distance from the front of your toilet to any wall or fixture is based on your local plumbing code. Some jurisdictions are listed under the IPC (International Plumbing Code). In this case, 15” of clearance is required. However, if your jurisdiction is listed under the UPC (Uniform Plumbing Code), you’ll need a bare minimum of 24” of clearance. To calculate this distance, you’ll want to measure from the very front edge of the toilet to any wall or fixture in front of it. Where should the cold-water supply line be placed? The first thing you’ll want to do is measure 6” to the left of your toilet flange. From there, measure 7” up the wall from the finished floor. Make sure you have your calculations correct. If the water line is too low, you’ll have to notch the trim. This is a hassle and a pain in the neck. To be safe, you can go higher if you want. Trying to install a toilet that’s too big or small for the given space. This is why it’s important to calculate your dimensions before you go out and purchase a new toilet. Violation of your local plumbing code. By following the tips listed above, you can ensure your toilet will fit right, will work well, and will be as comfortable as possible when you’re using it.